Peter Jackson has a well established track record with fantasy genre films having previously completed The Lord of the Rings Trilogy, which was not only a box office success, but also took away many Oscars. His adaptation of Tolkien’s The Hobbit remains controversial, with many questioning the sense of stretching out a modestly sized children’s book into another three movies. 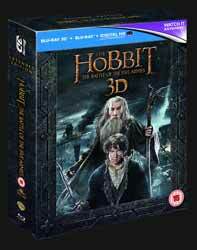 The Hobbit: The Battle of the Five Armies (2 hr, 44 min, 02 sec), directed by Peter Jackson, brings to a close the current trilogy and whilst the previous two films cannot be said to be without incident, they tended to be episodic in nature betraying the fact that he had included a lot of supplementary material, as well as creating wholly new characters to aid the flow of the narrative. If the first film in the series was a study in patience, the second, more akin to a mystery film, Battle jumps right out of the gate with the dragon Smaug laying waste to Lake-town with a level of spectacle that barely pauses throughout the film's length - creating a very ‘in your face’ action movie. You not only have the main battle, which takes place at the foot of the lonely mountain (Erebor) between the dwarves, men and elves all vying on some level for a portion of the mountains wealth, but the film also provides you with more urban street-to-street fighting in the defence of the town of Dale, where the last of the survivors of Lake-town are attacked by another army of Orcs. Finally the film provides the bittersweet single combat between Thorin and his nemesis, Azog. This is not to say that the film lacks character beats. The character of Thorin was somewhat unkindly referred to as the poor man’s Aragorn, but this would be disingenuous to both the character of Thorin and Richard Armitage as an actor. True, they are both destined to rule, the difference being that Aragorn was initially reluctant to take his rightful place, whereas the films of the trilogy are as much about Bilbo (Martin Freeman) as they are about Thorin. Even when the two come into their Kingdoms, Aragon blossoms into a good and wise king, Thorin, on the other hand, becomes paranoid and a megalomaniac when he succumbs to the ‘Dragon Sickness’ which hangs over the gold. Not even Bard (Luke Evans) or the elven lord, Thranduil (Lee Pace) are able to make him see sense. Many of the details from the book have been altered for the film; the separate armies of Orcs and Wargs are amalgamated and split into two joint armies. Azog (Manu Bennett), who is dead by this time in the novel, acts as an amalgamation of various other orc and goblin commanders. Personally, I never had a problem with this as it streamlines some of the storylines. Turiel (Evangeline Lilly) and Legolas (Orlando Bloom) are shoe-horned into the battle, partly to add another connection with The Lord of the Rings (he is sent to find Aragon at the end of the battle) and partially to make up the lack of female roles in Tolkien’s work. That said it would have been nice to see a bit of role reversal as it still end with the helpless female being rescued by the heroic male. Fran, what were you thinking? This new version is not only in 3D, but is also the inevitable extended release. In the previous two releases the extended material was nice but you would not have missed anything by their exclusion. The same cannot be said for this film, with some really nice character beats, we find out what happened to Alfred, which is both funny and horrific in equal measure, but you also get a lengthy chariots sequence which is so good I’m not sure why it was cut in the first place. The extra material does not feel like padding and enhances the finished film. Extras? Well this is Peter Jackson so what you get is ten hours of material. It has the look and feel of all the previous appendixes’, in that it covers all aspects of making the movie, but is not presented in a conventional manner. You will not get formal discussions on various aspect of the film, what you get is information offered up in a very fun, informal manner, the overall effect is that you feel like you’ve personally wandered onto the set and are just having a chat about whatever aspect of the film's making interests you. This makes for an incredibly enjoyable and relaxing experience and I found myself so immersed in these that hours would go by unnoticed. So, what’s not to like, it is arguably the better of the three films, with both wall to wall action and deaths and partings which will bring a lump to your throat as well as the ever watchable cornucopia of extras.